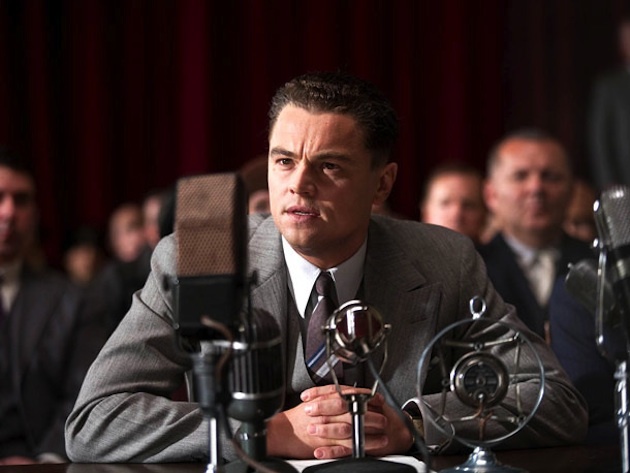 LOS ANGELES — To transform himself into an aging J. Edgar Hoover, Leonardo DiCaprio sat for hours at a time while makeup artists gave him liver spots, yellow teeth and big, bulbous love handles. He spends a good chunk of Clint Eastwood’s film “J. Edgar” that way, sweating and sneering in the unforgiving lighting of F.B.I. headquarters. The part also meant memorizing endless monologues that needed to be delivered with Hoover’s own breakneck cadence. Additionally Mr. DiCaprio, who typically comes accessorized with a supermodel girlfriend in real life, had to wrestle aggressively with a man and then kiss him. Oh, and wear a dress. Faced with a role with demands like that, most superstar actors, even those eager to catch the attention of Oscar voters, would have turned and run. Look unhandsome and unheroic? Too big a risk, even with Mr. Eastwood at the wheel. Posted: 11/2/11 at 9:26 AM under News Story.